PPC (Pay-Per-Click) advertising empowers businesses with the opportunity of immediate search engine marketing. Let us ensure your campaign’s success. While you are working patiently on your SEO services, Pay-Per-Click ads will provide an immediate online presence in front of thousands of consumers. While these great tools are available to you from search engines like Google, Yahoo and Bing, they require significant time and research to manage. WEBii can manage your entire online marketing campaign, from the appropriate keyword research and ad copywriting to monitoring campaign progress and fine tuning the ad budget. 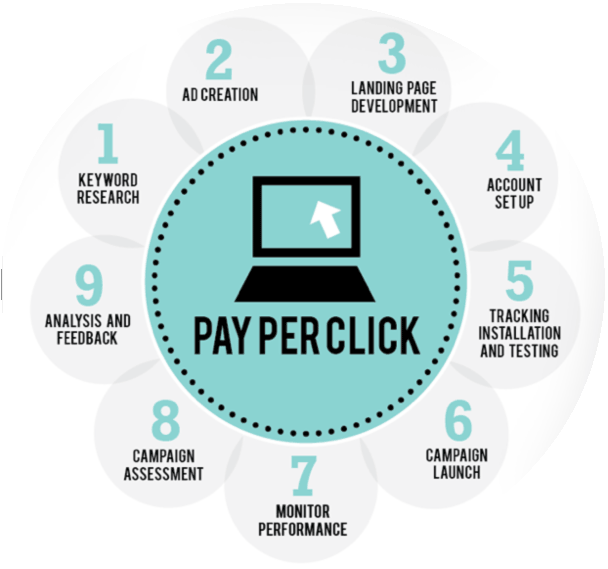 Our dedicated team will help ensure your PPC marketing campaign is successful and maximize the ROI of your ad spend. PPC operates like a “second search engine”, returning “sponsored links” and ads in designated areas of the search results pages. Typically you will see these highlighted ads at the top and side of the search page, around the “organic” search results. Advertisers (businesses like yours) bid on keywords that relate to their products and services, so that when a person searches online for that keyword or phrase, the related ads will appear. Since only a few top spots are available, the process of getting great ad placement requires competitive bidding and strategy. We will dedicate time and attention to setting up your ad campaigns and then continue to monitor and follow up. Our trained search marketing professionals will off-load the work so you can sit back and receive reports about the campaign progress and success. How are we different? At WEBii, we communicate and we care about your success. Contact us today for a proposal on our fully managed search engine marketing services.